To overcome this limitation you have to reach out to Salesforce support to enable Access Encrypted Data in Process Builder – beta feature. Let us start with a business use case. Pamela Kline is working as System administrator at GurukulOnCloud. She has received following requirement – when an Account is created, auto sync Account Name from Account Number. To solve the preceding requirement, we have to create a Process on the Account object to update Account Name from Account Number field. 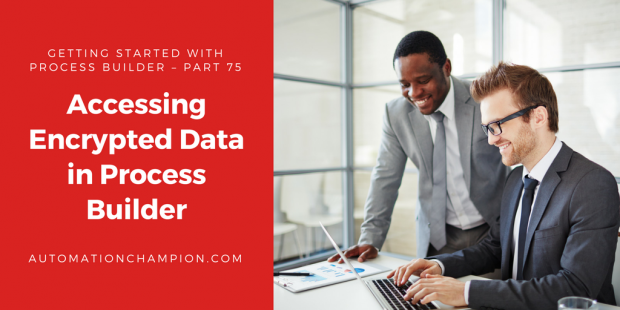 Before going ahead with solution make sure to raise a support case to enable, Access Encrypted Data in Process Builder – beta feature in your Salesforce org. Once you are done, click on the Save button. As I have already enabled Access Encrypted Data in Process Builder – beta feature in my developer org, I did not encounter any error while saving the immediate action. Next time, when an Account is created Account Name will sync with Account Number.